← 1: What is the Blog Calendar? For the past 6 years i’ve done a top ten list to finish off the year. As my interests have evolved and as my writing has changed, i’ve found it more difficult each year to try and pull together the list. This year I saw HackEducations http://www.hackeducation.com/2011/12/15/top-ed-tech-trends-of-2011-open/ post and thought… huh… that’s pretty much what i would have said. I’m sure I would have come at it slightly differently, maybe not spelled as well, but I don’t think i have significantly more to offer to that discussion. The only thing I would have added was Learning Analytics. So… check Hack Education’s list. I thought i might want to do something a little different this year… I want to talk about Black Swans. A black swan is a suprise event that changes the whole nature of a conversation. They are events that, in hindsight, EVERYONE wants to say they saw coming, but no one (or few people) predicted ahead of time. They are usually dramatic events, though it’s not the level of the drama that’s important, but rather the impact that it has. 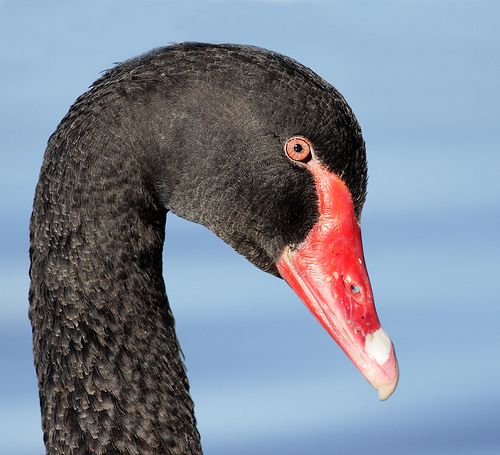 As we look into the future, speculating about black swans is useful in two ways. The first is that it is a nice way for us to discuss issues that are important to us in a new landscape. It provides a new context to talk about important ideas. In this sense, the content of the black swan is less important than the conversations that the black swan event allow us to have. Too often we are caught up in the minutiae of a discussion and can’t see what it is about our work that is important to us. The second, and maybe more obvious things about black swans is… they might happen. I’m going to propose seven black swan situations that could happen in 2012. I’m not suggesting that these things will ACTUALLY happen, but thinking about change can sometimes help us conceptualize it in our own lives… even if nothing dramatic comes around. I’m going to avoid any of the really nasty events… no wars, meteors or volcanic eruptions… sorry. There’s lots of change out there to talk about. Note: this post was edited rather significantly after chatting with Jeff Lebow and John Schinker on Edtechtalk. What happens if we have a system that actually works? One piece of software that does all the writing, all the games, all the learning and all the measuring you ever wanted. It works on all the computers, in all scenarios, and offered to us for free from Google. Not far from reality… just a few more steps and we’re there. What happens to Blackboard? We’re learning… lets use google. End of story. It works on tablets, on phones. It has scholar, docs, mail. What if we added google textbooks? We’d save a fortune on training… and give more power over to one company. I can’t imagine how the textbook companies could pull it off, but when a billion dollar industry is threatened, there are lobbying dollars to move around. There have been some excellent initiaties at the school level all over the united states, but in this scenario, all classroom textbooks MUST be paid for. Perhaps to ‘preserve quality.’ Maybe the argument is even less rationale than that. Does this move us more towards a different country to lead us? Can we get Finnish textbooks? Changing directions entirely, what happens in the price of oil hits a crazy high number. It sounds unlikely, but i never thought I’d see the prices we had a few years ago either. If it costs a fortune to drive, does that change things? Does that move us towards online education? How can we, in canada, rationalize heating a building all winter long just to put kids in it? Doesn’t sound crazy? Seems pretty normal eh? Think your way through it. A few years ago NYC invested $80 million in a student tracking system. Imagine the US government investing $80 billion in a system that tracks every student grade, up to the minute, and giving them a dashboard that told them how each school was doing… right now. Think testing is rampant in the school system now? Imagine what would happen in this scenario. Imagine the Kahn academy for the whole education system. At any given time, you’d be able to send ‘at risk’ students to the right tutor who could put them back on track. We’d know oodles about what kinds of things helped people ‘learn’. If that’s what we wanted Would it be worth it? Maybe we could refocus school time on projects… and art… and music. Or maybe we all stay home and press buttons on our computers. There are any number of reasons why this could happen… Out here on the east coast of canada, most schools are over 10% in their ratio international students to Canadian students. This is important for beefing up enrolment, but its also important for the extra fees paid by those students. If governmental regulations or incentives changed in any number of countries in Asia this could have a dramatic effect on Higher Ed. Would we try and teach them online? Would schools start to close? Would we try to attract students from other countries? The ‘international student’ has become a critical part of the fabric of higher education. Black Swan 2 – Free books for everyone! There is a battleground, right now, for content in higher education. We have billion dollar companies selling what amount to pretty average textbooks, and schools and different communities trying to create their own. What if the Thailand Government decided it was willing to put 10 billion dollars on the table to create free textbooks for everyone. One country (pick whichever one you like, could be Luxembourg or Saudi Arabia) offering free books, edited by renowned experts to the world. Would we take them? Is the content so transferable that we wouldn’t care who created them? MIT seeing Stanford pulling ahead in the free openness sweepstakes, decides that it will work to provide accreditation for open online courses. They themselves are safe in the knowledge that people will still come to MIT to work with the people/resources they have there, but they’ve decided that they are going to hire 10K tutors to evaluate people in the new MOOCs they plan to launch this year. 1 million students, 10000 tutors. What would that do? All the first year classes taught by 10 central institutions… what then?